1,563 km of cycling - as part of a bicycle world trip - from the island´s west coast to the south, crossing to the east coast, hopping to the islands Pulau Tioman, Pulau Kapas and Pulau Perhentian Kecil, following the East-West-Highway to the northwest coast and to Pulau Langkawi. 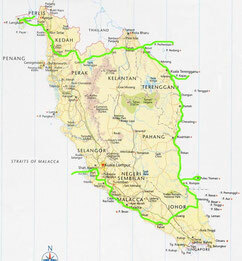 Do you like Cycling Malaysia? From Port Klang, the port of Malaysia's capital, Kuala Lumpur, I cycled south along the coast with Steffi. With a lot of traffic we went to Malacca through endless palm plantations. A city that lay on the coast of the same named street of Malacca. The isolated beaches on the coast invited only moderately for swimming. Not only was the Strait of Malacca the most affected by piracy in the sea, but all tankers illegally cleaned their tanks in the street. So it was not the beaches that kept us two days in the city, but the nice accommodation and the small French bakery in the shopping mall next door, which we relieved by a total of seven baguettes: My first real bread with cheese and Nutella for over two months ! 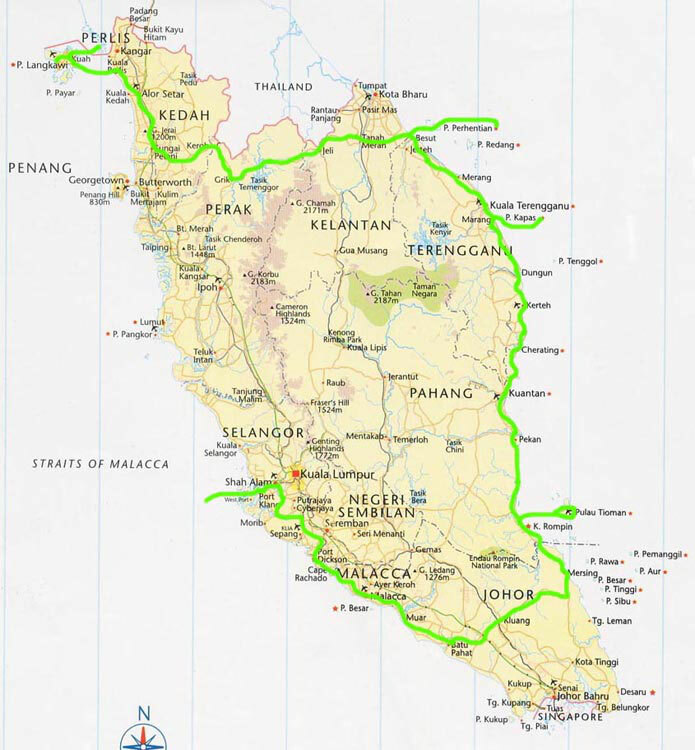 After another 100 km of boring ride on highways, we turned inland at Batu Pahat to the east, towards the tropical island of Pulau Tioman on the east coast of Malaysia. Once voted one of Time Magazine's 10 most beautiful islands on Earth, our expectations were high. It was not lonely, but we had one of the most beautiful cabins right on the beach with a large veranda and hammock. Back on the mainland we wrote 07.10.2005 and two days ago Ramadan had begun. From now on, this also meant fasting between dawn and dusk for us, because all the restaurants and food stalls along the road, except for the few Chinese, remained closed until the evening. So we fed during the day if at all, then at most times of biscuits. But Ramadan also had something positive, because in larger towns and cities in the evening at the largest mosque was a turbulent market with countless food stalls, where you could buy almost everything that Malaysian cuisine had to offer at a ridiculous price. So we hurriedly packed back to our room every evening and picked up what we had to miss during the day. We drove north along the beautiful east coast. North of Kuantan, we visited the turtle shelters at Kampong Cherating and Rantau Abang. Green Turtles regularly come to lay their eggs between May and September, and we were lucky enough to have laid eggs the night before, as well as hatching turtles, so we were able to see two-day-old turtles up close. The next night they would be released to freedom. But the big Giant Leatherback Turtle, the world's largest turtle, which can reach a length of two meters and a weight of up to 500 kg and only lay eggs in South Africa, Nicaragua and this beach in Malaysia, virtually did not come. So it was only one this year! Result of until recently uncontrolled tourism, pollution of the beach and endangerment of animals through nets and garbage in the sea. On the sparsely populated east coast we drove past beautiful fishing villages and secluded beaches to the heights of the tiny island of Pulau Kapas south of Kuala Terengganu. With only ten other guests on the island we spent two beautiful days with snorkeling and relaxing. Back on the mainland, after a day's drive north, we set course for our third Malaysian island: Pulau Perhentian Kecil, known for its beautiful coral reefs and beautiful beaches. So we were lucky enough to snorkel with a one-meter green turtle, puffer fish, mini sharks, barracudas, clown fish and countless even close-up fish. But after two days we made our way west, on the East-West Highway, which led directly below the border with Thailand through the mountains with untouched primary jungle back to the west coast of Malaysia. On the way we stayed overnight in Tanah Merah, where Mr. Mohd Hanuzi Zaharim and his family, whom we met in their cafe, invited us to their home. Of course, we had to get to know the whole family, so that it went first to the house of the sister and then to their own house, where we then even got a sarong as a gift. Back at the hotel, where we drank tea with Mr. Zaharim in the cafe next door, the sad news arrived: the son of a good friend of our host had died in a car accident in the afternoon. We had seen what was left of the cars on our way to Tanah Merah on our bikes. So the evening got a rather sad aftertaste. Due to the lack of available accommodation, we camped in my tent and hoped to not visit elephants at night because their huge dung heaps were found everywhere. The approaching northeast monsoon on the east coast we had now escaped, so we headed for the island of Pulau Langkawi on the west coast, our springboard to Thailand, took.